At Hunker, we love a good comeback story. 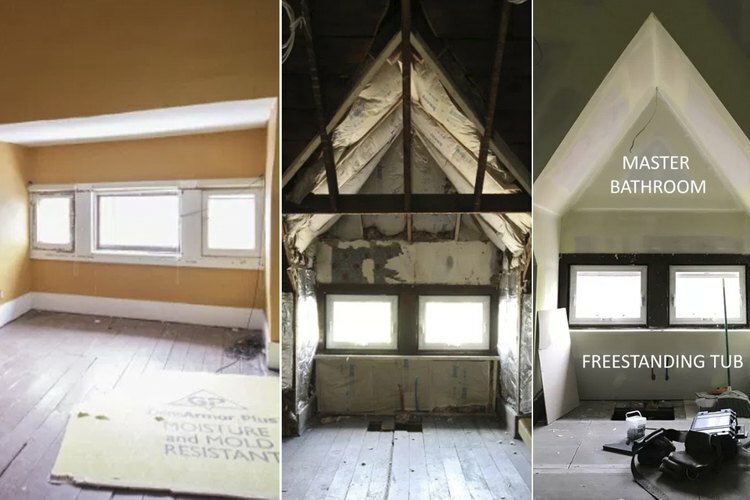 We've teamed up with Bona to bring you Good Bones, a series about four different homes where restoration projects brought new life to something old. Sometimes you don't so much choose a house as a house chooses you. For the Columbus, Ohio-based husband and wife design-build team Bryan and Catherine Williamson, it was a house they now call "The Blonde Vic." Discovering it was love at first sight, but through a painstaking restoration, the couple were able to make it even more their own. 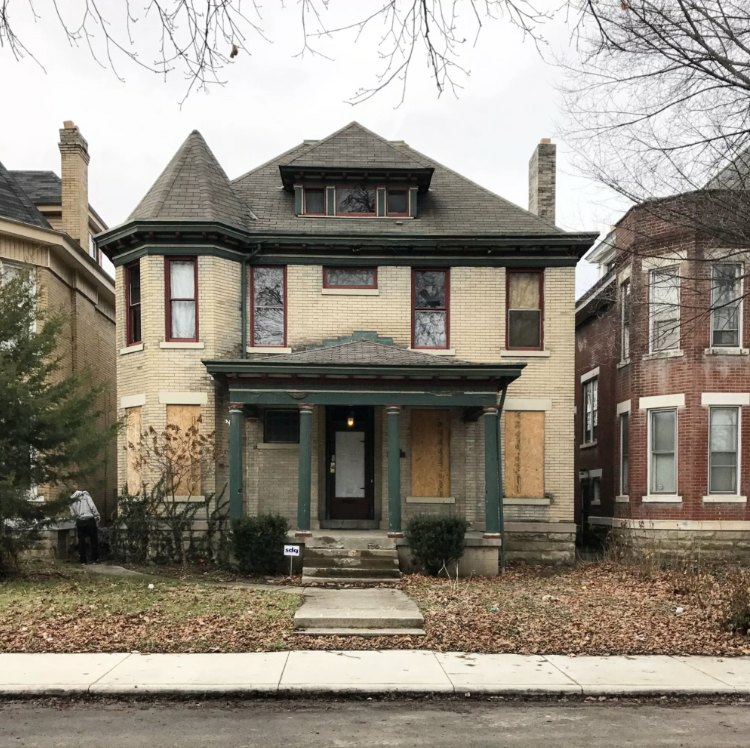 Built in 1900 and located in the historically African-American King-Lincoln District, the home is a massive 3,000-square-foot Victorian, spread out over three stories. It was dilapidated, the lower windows covered in plywood, doors and bannisters and trim inexplicably pilfered by previous tenants. But the overall layout, the majestic ceiling height, the energy and sense of community in that historic part of Columbus, were unmistakably special. 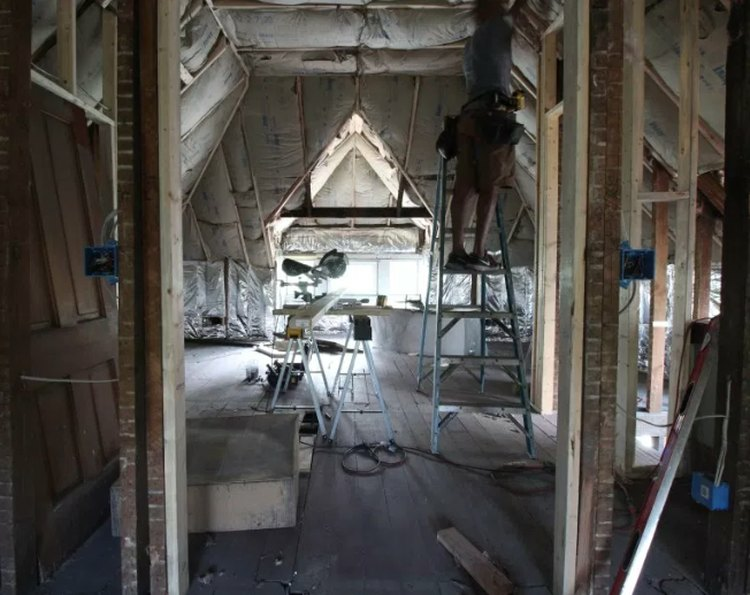 It had, as those who love old houses are wont to say, good bones. "We usually have completely different ideas about everything," says Catherine, of their often-competing aesthetics. "On this one, we were really aligned." Though the pair had had their eyes on the King-Lincoln District since moving to Columbus from New York City in 2012, they hadn't found the right property. And just as another sale for an investment property fell through, the owners of The Blonde Vic, also investors, reached out to them via Instagram. The investors, who had purchased the house at auction, had chosen to go in a different direction, and they wanted The Blonde Vic to go to people who would truly appreciate it for what it was. "It was so flattering to have someone reach out," says Catherine. They purchased it in January 2017 — and got to work. Progress on The Blonde Vic was slow, as they pursued other renovations through their design firm, Mix Design Collective. But the attenuated timeline afforded them time and space to be truly thoughtful. "There was a lot of room for us to put our own stamp on it," says Catherine. While they designed around the bones of the house, which they loved, and strove to retain as much of the original character that initially drew them in, there was a push to modernize as well. "We both really like the Parisian modern look, where you have a lot of molding and a lot of white, a lot of architectural detail and artwork and plants and colorful pieces," says Catherine. "Both of us, when we walked in, thought that's what we have to do in here." 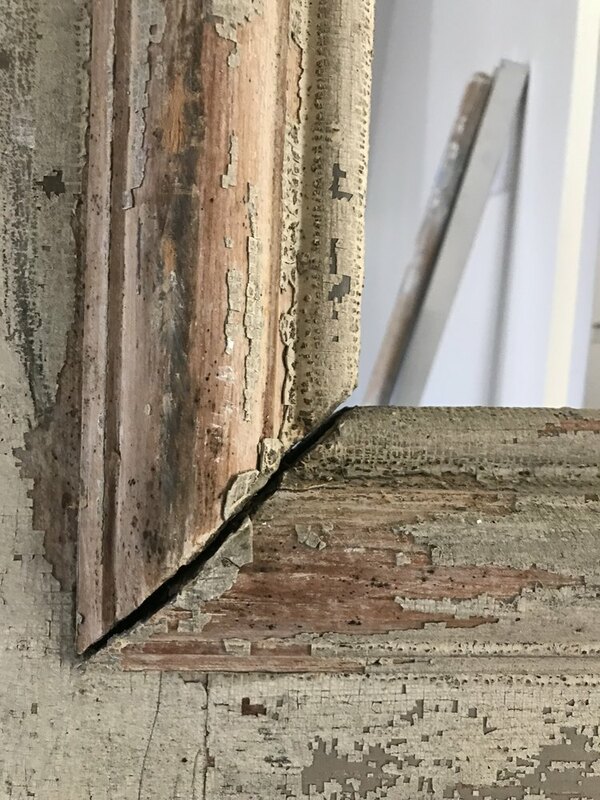 And while ambitious projects like refabricating the original bannisters, which had gone missing, were true labors of love and period-perfect restoration, other results, documented across their blog, Beginning in the Middle, make for astonishing before-and-after shots. In particular, the third floor has been utterly transformed. Originally servant quarters, the grand millwork and delicate wood inlays from other floors of the house were notably absent. "When you got to the third floor, the baseboards were less fancy, the doors were less fancy," says Catherine. Instead of the two small rooms, one painted a garish orange, the other a pale blue, the Williamsons envisioned one light-filled grand master suite, leveraging the 10-foot ceilings and peaked windows. 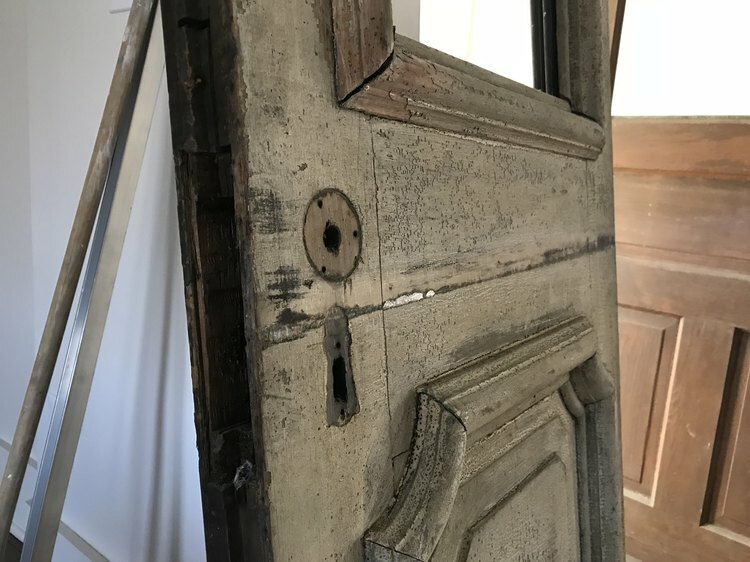 And at the heart of that master, between the bedroom and the bath, would be the centerpiece — two nearly 9-foot entry doors the couple had been eyeing at one of their mainstays, Columbus Architectural Salvage. 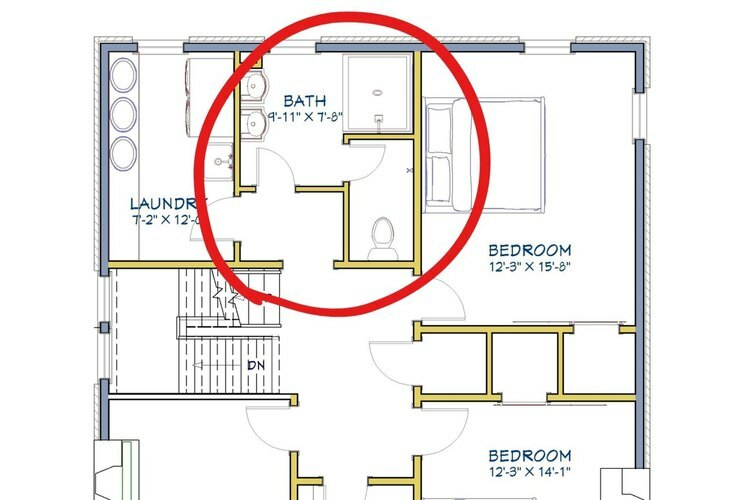 Brian began framing out the doorway to accommodate their height before they had even purchased the doors. With the doorway set, the Williamsons did the restoration themselves. One side of the doors was painted a "very chippy" beige. The other side was wood. Both doors were rife with dings and wear — which was actually one of the things that drew in the Williamsons. But it was a question of how to tie the look of the doors into the overall space. With competing wood doors in the master, the couple decided to repaint. They first scraped the paint by hand, instead of sanding, as the ancient paint was lead-based. Then, they repainted the doors with a striking Sherwin-Williams Tricorn Black, which makes a strong statement at the heart of the room. To maximize the space in the room, they chose to hang the doors on sliders, similar to ones used for barn doors. 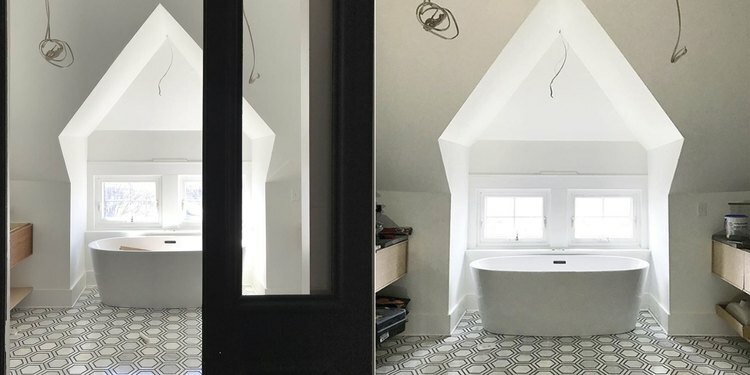 With the majestic height and the bold color choice, the doors are a nice contrast to the black and white marble hexagonal tiles from Mission Stone & Tile, floating wood vanities, marble shower, and crisp white freestanding tub. 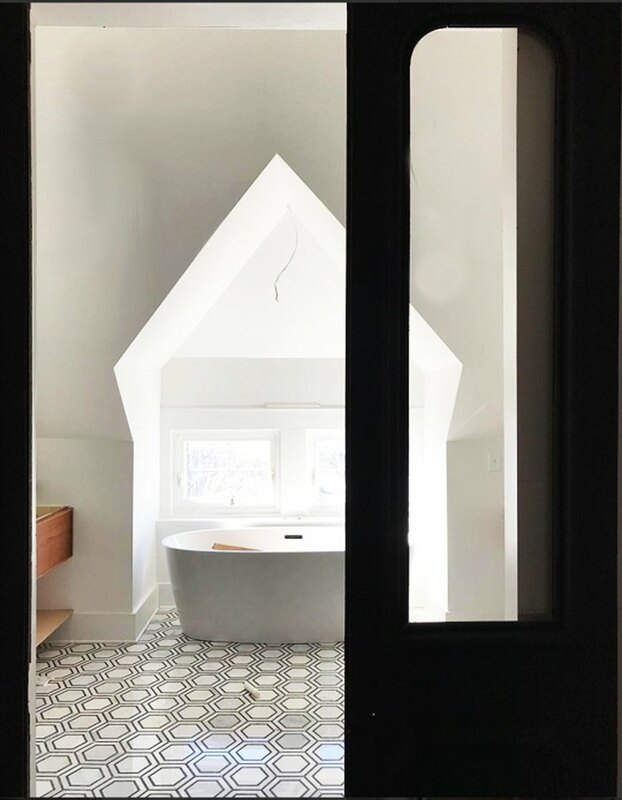 "We love that [the doors] have openings in them to keep the light flowing between the bedroom and bathroom," adds Catherine. 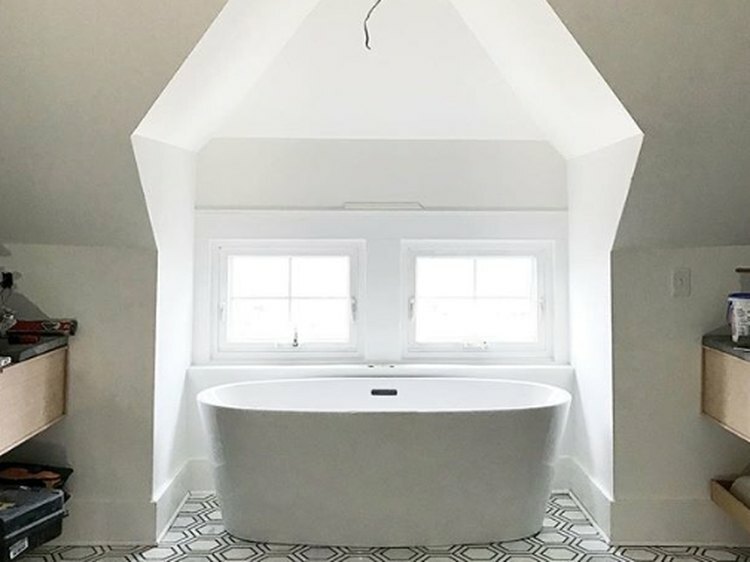 With the unfinished doors up, you can see the modern tub placed just-so beneath a peaked window. It's picture perfect. "If we had found regular doors, we wouldn't have planned to bump up the doorway by two more feet," says Catherine. 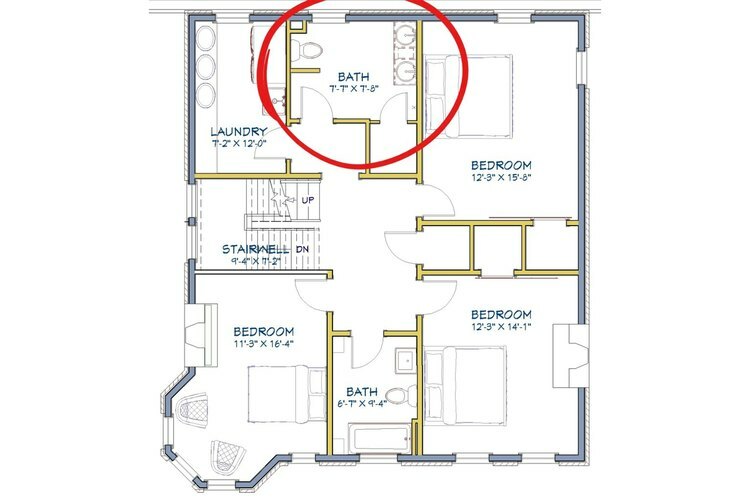 And the grand centerpiece of the master suite would never have materialized in such a way. It's that kind of serendipity, that feeling of it-was-meant-to-be, that has made The Blonde Vic her favorite home to date. The charm of vintage doors is undeniable, and the extent of a restoration can depend on how much of the age you want to showcase. 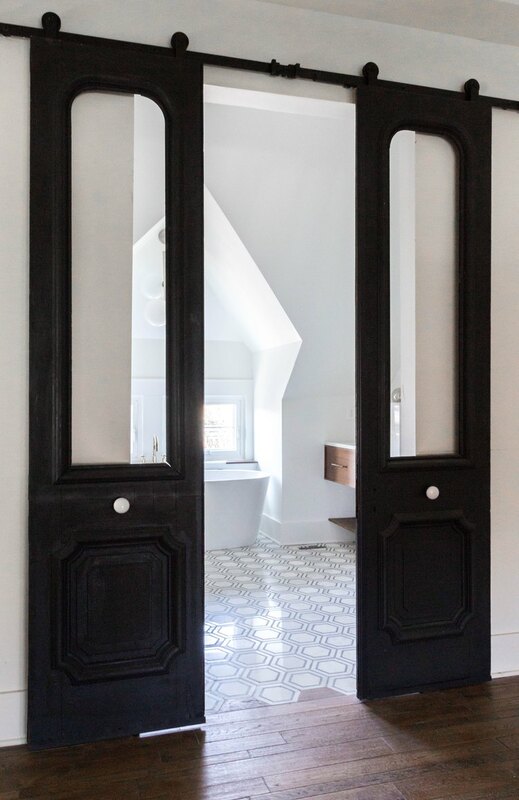 Antique doors, especially the more striking ones, aren't always typical door height. You may need to raise, lower, widen, or simply rethink your current door frame. Holes from old hinges, deep dings or scratches, or missing pieces can be sanded, filled, and repaired almost seamlessly with the right techniques. A new paint job might be appropriate, or perhaps a period-perfect stain. Tung oil can add a nice luster as well. Be prepared for several applications. If the doors are in good shape, you may simply want to polish knobs, locks, and keyhole covers. Or update the doors with antique or modern hardware for a more personalized look. It's projects like these that make a property stand out — even to experienced investors. "This one is special," Williamson says. "We have been emotionally attached to our projects in the past — I think Bryan is a little less emotionally attached, because as a real estate investor you're not supposed to do this at all — but I was pretty into it since before we bought it."